The R Hotel ... interiors dominated by white and earthy tones. The R Hotel resort and spa at Palm Jumeirah in Dubai – targeted at health-conscious travellers – is being built on a holistic health and wellness concept. Interior fit-out work has commenced on what is envisioned to be the first holistic health and wellness resort in the UAE. Slated to open its doors in April 2017, the striking hospitality project that exudes an aura of an oasis of peace is R Hotel’s new resort and spa at The Palm Jumeirah in Dubai. The group is expected to sign a partnership shortly with a renowned global brand in developing the concept and providing the treatments and services. Located at the East Crescent of The Palm, the 254-key property will also be the first four-star rated hotel at the upscale destination. The seven-storey property will feature rooms and suites, plus an Executive Lounge on the seventh floor, and Executive and Royal Suites on the sixth and seventh floors, all boasting private terraces with exquisite views. The resort and spa will have a pool area and private beach with sun loungers and cabanas. There will also be a dedicated kids’ swimming pool, playground, gym and tennis court, and separate spas for men and women with hammam, sauna and steam bath. Erga Progress is responsible for the hotel’s architecture, Studitalia holds credit for the hotel’s interior design, while Four Zone Middle East is the fit-out contractor. 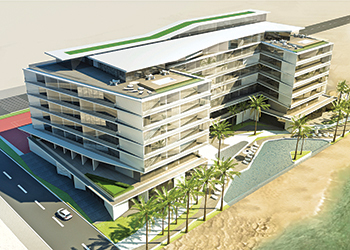 The new property is located on The Palm Jumeirah. 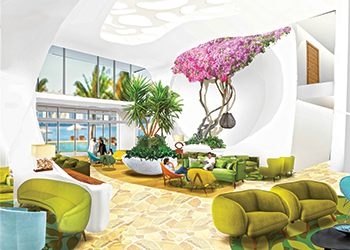 Commenting on the project, Samir Arora, the pre-opening general manager of R Hotels’ property at The Palm, says: “The holistic health and wellness concept came in at a later stage of the planning. Since the property is situated at The Palm with a beachfront, it became easier to integrate the well-being aspect into the overall design. The design concept is modern with a touch of the rustic style. 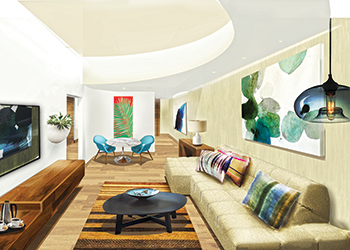 As a wellness resort, the lobby and common areas will radiate a fresh, calm and tranquil ambiance; hence the design tries to incorporate as much natural sunlight and natural flora as a design feature, according to Arora. “The hotel’s main target markets are health-conscious travellers, and hence this aspect plays an important part in the design. These markets mainly fall under the Generation X, Y and millennial age groups, who are more mindful of their well-being, and are essentially looking for a distinct experience when they visit a destination. These groups are also tech-savvy; hence, the latest in hotel technology will be incorporated in the design, complemented by contemporary arts, patterns, and components to suit their tastes,” he says. “It will also tap into family travellers, thus the interiors have to convey an impression of spaciousness to move around the property, especially for the children,” Arora adds. The R Hotel resort and spa ... modern design with a rustic touch. The overall colour scheme throughout the property is white and earth tones – mainly shades of green and brown, with pops of warm and vibrant hues. Most of the finishing and materials used are wood, marble and stone, glass, and linens while the wallpaper will feature modern designs, and guests can expect to see a lot of natural elements including plants. Tech Group completed the first phase of the construction which included the piling and foundation works. ANC Contracting (ANC) was appointed as the main contractor and Erga Progress Engineering Consultancy as project consultant, for the second phase of construction. The MEP (mechanical, electrical and plumbing) works are done by Bin Sharaf Electro Mechanical Engineering. The lighting supplier is dpa Lighting Consultants; LMS International is in charge of the landscape; the kitchen is done by Wotek; and the HRM Solutions is the food and beverage consultant. All the other suppliers have been sub-contracted by ANC.